A herb from the Maluku Islands, Myristica fragrans is one of the most remarkable spice plants that has been used centuries ago, especially two main products, mace and nutmeg, and has become popular all over Europe by 12th century’s end. Both Indonesia and West Indies are accounted for its massive production and supply to the world. 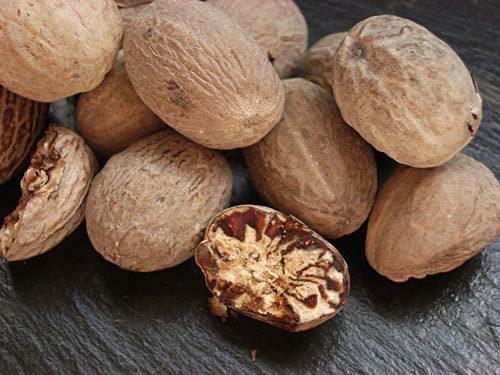 Growing and thriving in humid climates, nutmeg trees need constant water but not flood, ripe fruits crack open even while still on the tree and seeds are dried for about two months to crack the shell showing the fragrant interior. Aside from being a widely used spice, Myristica Fragrans is also known to affect the central nervous system (CNS) although effects vary, but there is also notable depressant and excitatory effects known, wherein the serotonin and dopaminergic pathways might be responsible of. In animal studies, M. fragrans showed anticonvulsant activities in mice. And according to reports, the chemical components responsible for effects on the central nervous system is ‘myristicin’ (a type of weak and hallucinogenic monoamine oxidase inhibitor), safrole, elemicin and anxiogenic trimyristin and with some components being structurally close to serotonin agonists. Nutmeg has been considered a psychoactive to produce hallucinations and fear/anxiety for many years, and part of that is long-term abuse that has been noted, too. One insight is that the spice has been classified as a deliriant for the British sailors who first discovered its mind-altering effects. In history, these sailors were once desperate running out of rum and seeking to break the monotony, so they decided to dip into the spice for a slightly hallucinogenic psycho stimulating effects. As a result, oftentimes, cargo ship slaves would be caught and then punished for abusing the herb’s mind-altering effects. Users often equate Myristica Fragrans spice and its spice sister ‘mace,’ because both of which have similar active ingredients as MDMA or MDA and which a dosage of one to 10 tablespoons (five to 20 grams) are consumed for psychoactive effects. However, nutmeg when ingested is noted for its long come up in which effects would come only after at least five hours, leading to long duration that could last up to two days. For psychoactive effects, M. fragrans is taken in powder form. It has been noted that when taken with MAOIs, Myristica Fragrans could interact badly; thus, it should be avoided. In minute doses, people use nutmeg for feelings of happiness and for preventing depression, reason it is commonly used in Yule celebrations. Do you have an interesting story to share about nutmeg, or have used it for cooking recipes for hallucination? Share your experience with this entheogenic drug with the community today!